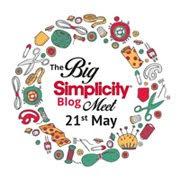 This summer I was asked if I would like to become an official member of the Simple Sew Patterns blogging team. With it in mind that a large percentage of my makes to date have been Simple Sews, it would be frankly mental to turn the opportunity down! I'm going to be posting reviews, pics, hints and tips as we go along. So expect loads more Simple Sew patterns popping up on my blog. Looks like I've made it guys! First up is the Charlotte Dress. The pattern has two different necklines and three different sleeve lengths- or sleeveless if you fancy! 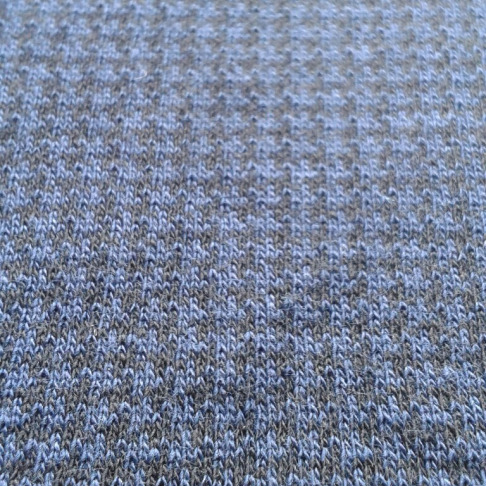 I took a browse round my usual haunt Hillsborough Fine Fabrics Sheffield on the off chance I found the perfect fabric. Despite it not mentioning jersey fabrics on the pattern packet, browsing the Simple Sew website it looked like the model had a Charlotte made out of green jersey. Being quite a fan of sewing with knits (and so much comfier to wear right? 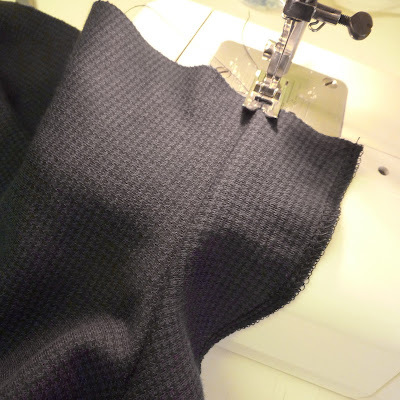 ), I was on the lookout for a stretch fabric that wasn't too plain. Anyone who knows me even a little will know something of my love for Houndstooth- so I was totally chuffed when I landed on the last little bit of this black and navy tiny houndstooth jersey! The design is subtle and was already shouting office wear at me. The pattern states 2.78m of 45" fabric, but I wasn't put off by there only being 2m left... I was going to have to make it work! My measurements matched up to a size 8 on the size chart, apart from my waist which was closer to a 10. I traced off the pattern and graded out to a 10 for the waist. I guessed this might end up a little on the larger size as I was using a stretch fabric, but much better to be safe than sorry. Who has time for a toile?! Not me! Though I would recommend making one if you have the time/fabric/patience... All of which I was fresh out of. My fabric had stretched a little on the washing line (always launder your fabric first guys!) so made matching up selvedges a bit of a wobbly nightmare for cutting out. With this and the fact that I maybe wouldn't have enough fabric in mind, I decided to cut all the pieces out as single layers. I find this a MUST when pattern matching, but as the houndstooths (houndsteeth?) are really tiny, pattern matching wasn't going to be an issue here. 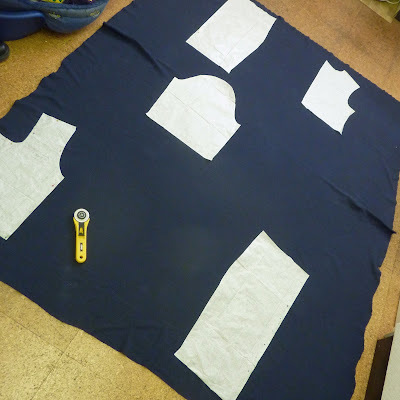 The way I like to do it is to cut the pattern piece, then flip it- fabric with paper still attached down the centre line, then cut the second half. It makes for great symmetry and is also more economical.. but just a bit of a pain when you don't have much space. Plus I guess it takes twice as long. Lucky for me I could fit everything on my 2m fabric, including the 3/4 length sleeves I'd been eying up. On first thoughts I thought the skirt looked a bit short, but then I remembered I ALWAYS end up making skirts shorter- plus it looked pretty foxy on the model on the website so I went with it (right decision). I cut the lot out on my kitchen floor using my rotary cutter which is possibly my favourite tool in my sewing kit- really can't beat it for precision. 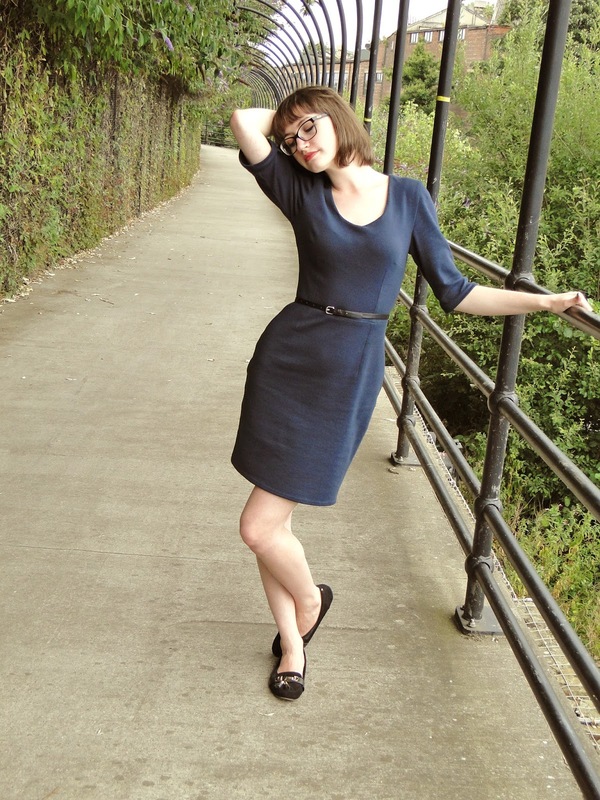 After the success of my cap sleeves on my Cosmic English Tea Dress (another Simple Sew! ), I was tempted to go for them again, but was really thrown off with the pics on the instructions. I really wasn't sure which bits needed to be stitched together and then how they needed to be inserted when stitching on the facing. They are meant to just 'pop out!'?! Maybe if I'd cut them out and played around a bit it would have made more sense! Seeing as Autumn is on it's way I had no problems with making long sleeves. Also- confession time! I get a bit freaked out by arm hole facings! As I never toile up, I tend to make adjustments as I go and find this really difficult to do once a facing is attached. I also feel this way about linings and haven't really found a way round this yet. Am I cheating?? 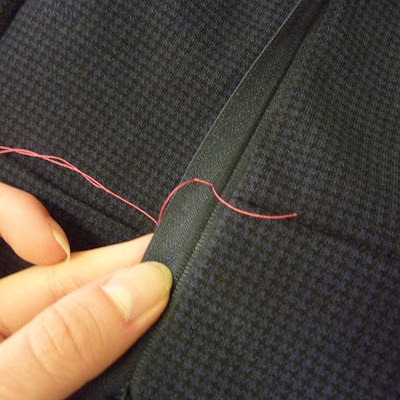 I have however, discovered a new love for tailor tacking after I made my Simplicity Jacket. I used to think they were total faff, but in reality they are much less faff than tracing wheel and carbon paper. So for the Charlotte Dress I tailor tacked all the dart points and cut notches for matching up at the wide end of the darts. Once I'd stitched them in I pressed the hell out of them (with a tea towel under the iron to save from any scary singeing... Been there, done that). What it really important with this dress is lining up all the seams and making sure bodice darts match the skirt darts. It's definitely worth taking time to get it right to get a really elegant finish. I'm a bad girl who doesn't make toiles and also hates interfacing. My second confession is I did not interface my neck facing... But you definitely should! In the past I have not liked to interface stretch fabrics as it seems to mess with the stretch-factor and then I worry about it sitting funny. The neckline could definitely do with some stability though. Is stretchy interfacing my answer? The Charlotte Dress is described as being 'Easy Fit' which means it isn't as tight fitting as some of the others in the Simple Sew range. I tried the dress on at various stages of the making process and couldn't help but feel it would look better on me if it was a little tighter. So I made a few adjustments. To start with, I took 1 inch out of the side seams from bust to waist, then graded back out to the original hip size. Already it looked 1000 times better on me. go over it again now I had separated them. Thankfully, using knit fraying wasn't going to be a problem, so I settled for raw edges here over a bulky midriff. 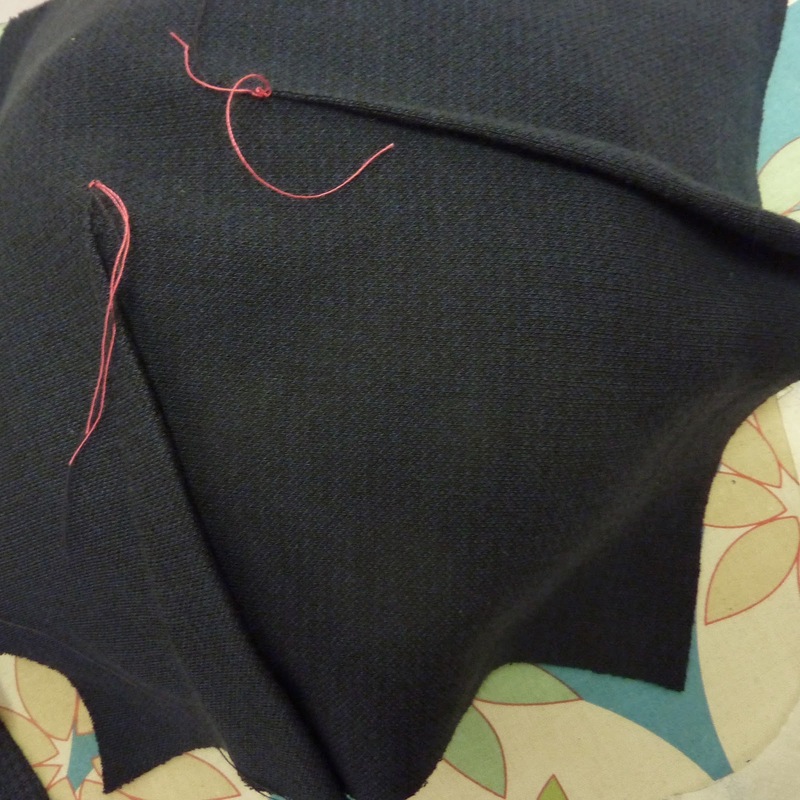 I overlocked the centre back on both sides then pinned and TACKED in my zip. I opted for an invisible zip as they always look so classy. I'm a big fan of tacking in the zip prior to machining as it gives you chance to try on and check fit before committing. I used a 2cm seam allowance here instead of a 1.5cm. It really adds to the overall finish of the dress to match up the waistline seam at the centre back when putting in the zip. What I like to do is tack one side in, zip the zip back up then put a little tack into the zip tape that hasn't been stitched where it meets the waistline. 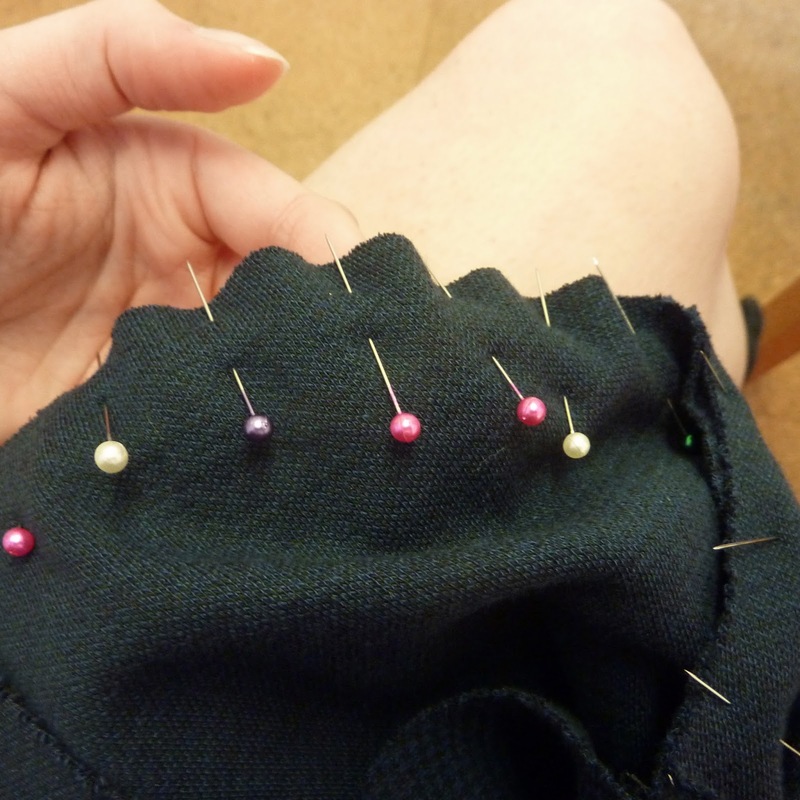 This can then be easily matched up when pinning and stitching to the other side. Sleeves are usually my nemesis, but ever since the Simplicity Blogger meet up, May Martin's tips on 'Bubble Easing' a sleeve head into the arm hole have been a life changer! Instead of playing around with gathering stitches, I first matched up notches and underarm seams, then eased the sleeve fabric into place with little 'bubbles' between pins. I tacked then tried on, and as I suspected needed to take in a little more- particularly on the shoulders. 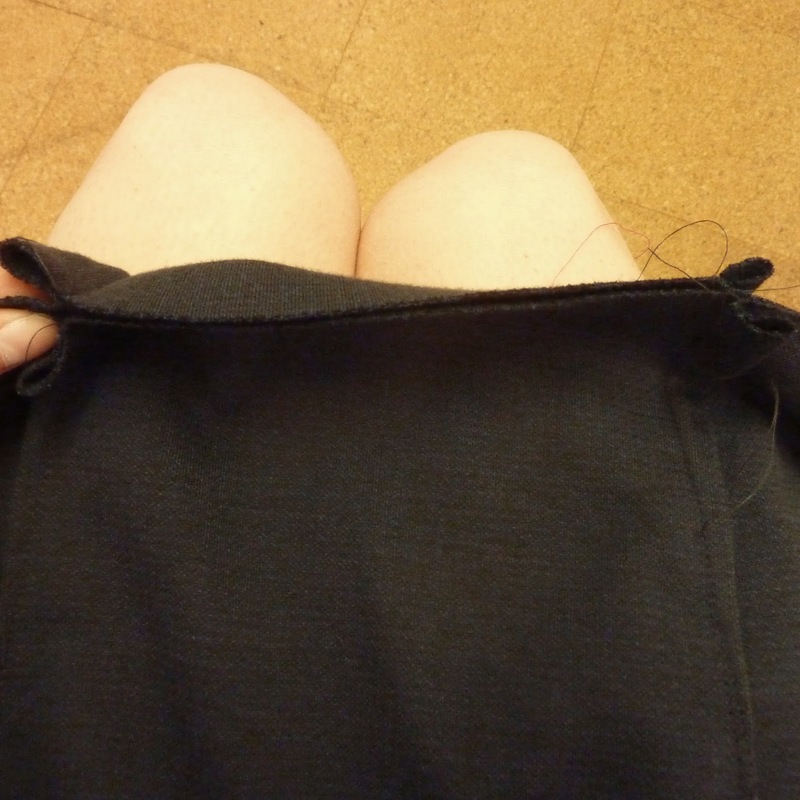 I upped the seam allowance to 2cm instead of 1cm and machine stitched. Tried on, looked good, overlocked. Repeat on the other side and I'd achieved perfect sleeves in record breaking time! So what was left was a lot of pressing and skirt and sleeve hems. I did a double turned hem on both the sleeves and skirt (pinned first then tacked because we were doing well and didn't want to ruin things with a wonky hem). I used my twin stretch needle for a neat professional finish... and voila! 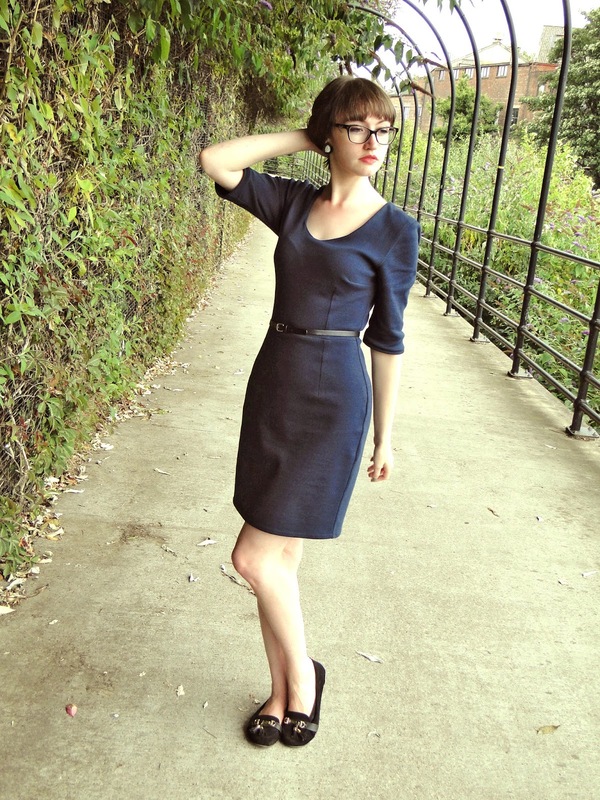 One Simple Sew Charlotte dress, cut and sewn in 1 weekend and ready for my business trip with work this Wednesday. Loved the pattern- I think I took loads out of the side seams based on the fact I was using stretchy fabric and also because perhaps I had my sights set on a closer fit than the pattern intends. I'm intrigued to see how I'd get on with a woven fabric, which I suspect would suit a looser fit better than jersey. Maybe even next time I'll take a shot at those capped sleeves. Very nice stitching job! You look great!